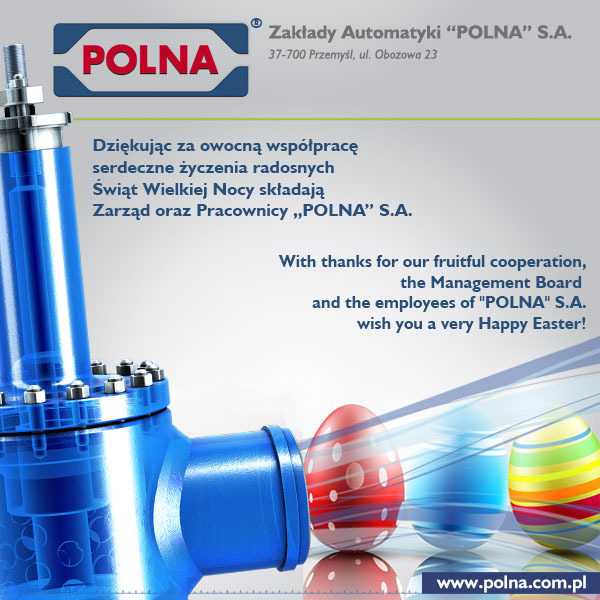 Manufacturer of flow control valves, pneumatic actuators and piston desuperheaters | POLNA S.A.
90th anniversary of “POLNA” S.A. The Quality Management System and the quality policy of our company are based on the Process Approach and constant improvement. It enables us to increase the added value, thus making our products more attractive for the Customer. "POLNA S.A." takes care to constantly develop especially concerning the designing of new products and improving the existing processes, being governed by the Customers’ needs. All our company’s products have identification marks, showing their parameters in accordance with the marks enclosed in the product catalog. Each product leaving the company is provided with full technical and commercial documentation complying with the binding regulations. “POLNA” S.A. specializes in designing and manufacturing of control valves used in technological installations in power, petrochemical, gas industries as well as many other branches of industry.